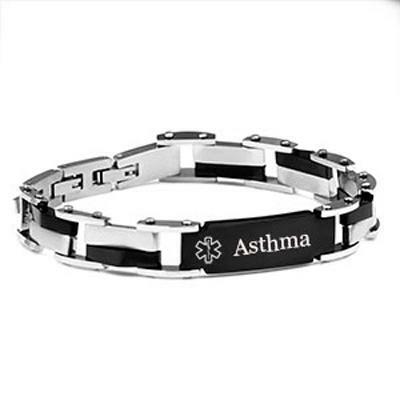 Our Handsome guy's 316L surgical grade stainless steel asthma bracelet features alternating black plated links, a shiny black stainless medical id tag, and is adjustable to create a size 7, 7 1/2, or 8 inch bracelet. This bracelet is initially 8 inches. 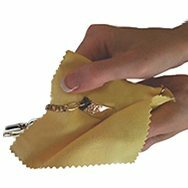 To adjust it to a smaller size, you simply remove one or both of the interlocking clasps. This allows the bracelet to fit a range of wrists from 6 - 7.5 inches. Front of the medical tag is pre-engraved with Asthma. We can custom engrave the back of your id tag with your personalized information. Weight: 1.52 oz. / 43 g.
Do not order if your wrist/arm does is not within this range. There is no re-sizing. Please enter engraving in UPPERCASEt. Please be sure to leave spaces for clarity!